Lark Cake Shop in Silver Lake is a little hard to find for those not familiar with the area and parking isn't easy to come by either, but they have over a dozen different cupcake flavors including a Vegan Chocolate Orange Cupcake, which was very citrusy and quite good for a Vegan recipe, plus an Old fashioned Ice Box Cup Cake (in chocolate and gingersnap) that costs a bit more than the others because of its larger size. 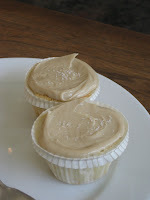 The shop came recommended by a fellow LA Cupcake MeetUp group member who loves their Salted Caramel Cup Cakes. 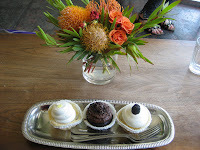 I liked their icebox, red velvet, chocolate mousse and carrot cupcakes the best. I had also ordered a lemon cupcake and a berry shortbread cupcake, however they were more shortbread than anything with only a tiny bit of curd inside, which was disappointing and also dry. The others, however, weren't like that. 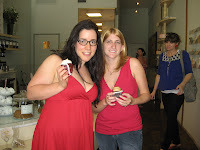 Joining our group this week was Cupcakes Take the Cake blogger Rachel who was visiting from New York. Whoa blondie. Lay off the cakes, you're getting real pudgy in the middle, unless that's just really an unflattering shirt. I read "lard" instead of "lark" the photo didn't help...so glad I read the whole post. I am a nut! What's with the anonymous comment up there?! Anyway, I'm excited to try this place out. I go to Silverlake pretty often, so I'll drop in some time. Tara, it was SO great to meet you! Thanks so much, I had a fabulous time and hope I can make another LA meetup soon too (and vice versa when you're in town again). To anon- Shuddering? Dang, I'd hate to see how you'd react to seeing someone who was actually heavy. I hope you don't own a gun. Fucktard? OMG Meghan I love it, I'm going to start using that. I am a guy, I own a gun and I have great taste in women. Smile, eyes, body, everything about you is fantastic !!! Just a man's perspective for you. that's an awfully rude comment, you look great. OMG, Salted Caramel cupcake! YUM! And a giant STFU to the first anonymous commenter. what an absolutely ridiculous comment! I'd say that somebody else has some issues....!